Production of the five-segment powerhouse motors for the Space Launch System (SLS) solid rocket boosters is on target at prime contractor Orbital ATK's facilities in Utah, with 10 motor segments cast with propellant and four of those segments complete. Following propellant casting, the finished segments were evaluated using non-destructive techniques, such as x-ray, to ensure they met quality standards, and the exterior cases were painted white with black-and-white photogrammetric markings. All motor segments will ultimately be shipped to Kennedy Space Center, where they will be integrated with forward and aft booster structures and then with the SLS core stage. The markings on the outside of the complete boosters look like black-and-white checkerboards and serve as "targets" for cameras located in strategic locations on and around the vehicle and will be used for photogrammetry, the science of using photography to help measure distances between objects. In addition to the boosters, black-and-white photogrammetric targets will also appear on the SLS core stage, the interim cryogenic propulsion stage and the Orion stage adapter. On Orion, NASA's deep-space exploration spacecraft, photogrammetric markings will appear on the spacecraft adapter. The mobile launcher will also have photogrammetric markings. In addition, certain elements of the integrated stack, like the launch vehicle stage adapter, have photogrammetric markings on the interior rather than the exterior. Cameras will be located on Orion, on the rocket's core stage, on the interior of the launch vehicle stage adapter, on the ground and on the mobile launcher. The cameras will be able to more easily track the vehicle's position in space by fixing on the black-and-white checkerboard targets. NASA's photogrammetry analysts will then use software to process the images from the cameras to measure distances, such as between the boosters and the core stage after those elements separate. Engineers are also interested in measuring the booster nozzles' clearance from the mobile launcher and the entire vehicle's clearance from the mobile launch tower shortly after liftoff. One area engineers are particularly interested in is how the SLS solid rocket boosters, the largest ever manufactured for flight, will separate from the core stage. "Booster separation is influenced by several factors -- their length, the configuration of the separation motors and the timing of separation," explained Alex Priskos, SLS systems engineering & integration manager. "The longer separation is delayed, the greater the clearance will be. However, waiting longer adversely impacts performance. Our job is to balance these factors." Engineers designed SLS using state-of-the-art 3D software models and analysis, explained Beth St. Peter, SLS imagery integration lead. "As accurate as those models are, photogrammetry will provide real-life 'truth data' on separation events and other key points. And for the first flight of SLS, gathering this real-world data on how the vehicle performs compared to the models is crucial." Although NASA has used photogrammetry since the days of the Saturn moon rockets and the space shuttle, use of the technology has come a long way, St. Peter said, primarily due to advances in being able to place digital imagery systems on launch vehicles. SLS and Orion will incorporate different types of checkerboard patterns, or photogrammetric targets, which will be used for different types of measurements, noted David Melendrez, Orion's lead for imagery integration at Johnson Space Center. "The big squares will be used to measure general vehicle motion and ground clearances. Smaller checkerboards and elongated markings will be used to measure more complicated three-dimensional motions of the boosters relative to the core stage during their separation, about two minutes into the spaceflight." On some parts of the rocket, smaller circular markings will help the cameras and photogrammetric software measure separation events, like Orion's separation from the interim cryogenic propulsion stage. "Some of these smaller markings will also have retro-reflective centers to help improve our ability to see them under the dark conditions we're likely to encounter on-orbit," Melendrez said. In the final design, the photogrammetric checkerboards will replace the orange and gray stripes that had been previously considered. "Designing and building these deep space exploration systems is an evolutionary process," Priskos said. "In the beginning, you define a mission and a basic architecture to take you where you want to go. The details might be a little fuzzy at first, but gradually, like a camera zooming in closer and closer, those details are revealed. 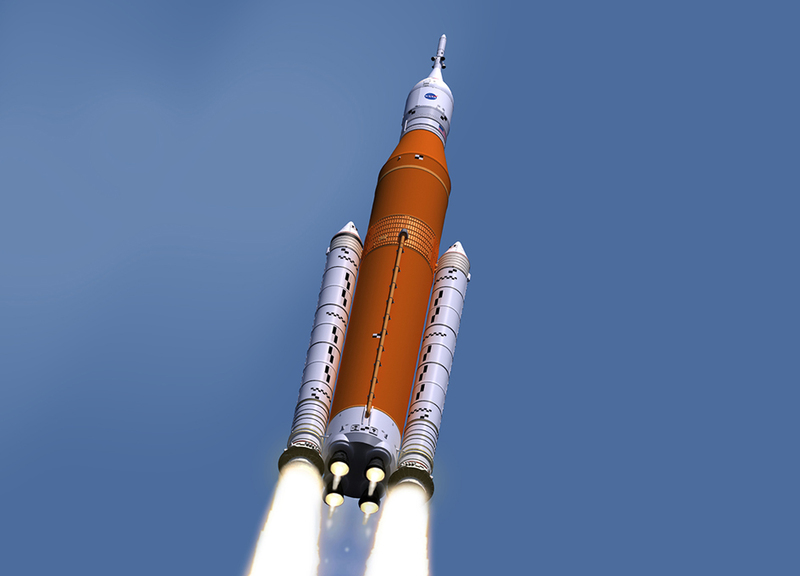 This is where we are with SLS and Orion." On launch day -- and during the duration of the first mission -- it won't just be the engineers on the ground who see the imagery from the cameras located at various spots on the vehicle and ground. "Some cameras will record imagery onboard SLS and Orion and transmit later. But there will also be some live downlinked imagery from these cameras on launch day," Melendrez said. "People watching at home will be able to see some of this imagery live on NASA TV." With the application of black-and-white photogrammetric targets on the solid rocket boosters, NASA's new capability for exploring deep space is becoming clearer -- and closer -- all the time.